Newcastle have added to their French contingent by signing midfielder Moussa Sissoko from Toulouse for an undisclosed fee. Sissoko follows Yoan Gouffran,centre-back Mapou Yanga-Mbiwa,left-back Massadio Haidara and right-back Mathieu Debuchy to St James' Park. The 23-year-old has signed a six-and-a-half-year deal and will wear the number seven shirt. Sissoko said: "I am delighted to be a Newcastle United player." The player, who came through the youth ranks at Toulouse, has six senior international caps. Newcastle manager Alan Pardew said: "This transfer window has proved very productive for us and Moussa arriving is a massive plus for the club. 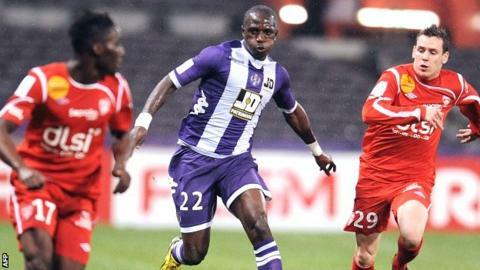 Toulouse had earlier revealed Sissoko would be signing for the north-east side. "Moussa Sissoko will not go to the end of his contract. He found an agreement with Newcastle United for a definitive transfer," the club announced. Before Haidara joined from Nancy, Gouffran was recruited from Bordeaux and Mapou Yanga-Mbiwa from Montpellier, while Debuchy arrived from Lille. Yohan Cabaye, Hatem Ben Arfa, Romain Amalfitano, Sylvain Marveaux and Gabriel Obertan are already at St James' Park. Pardew's side finished fifth in the Premier League last season but they are 16th in 2012-13, two points above the relegation zone. In other Newcastle news on Friday captain Fabricio Coloccini agreed to stay at the club until at least the end of the season.